After using discs for the past few years, I've been frustrated by bending discs when I UPD in rocky areas, which happens frequently on the dry rocky trails I ride. When I bail, the unicycle will fall with the disc hitting a rock on its face, which bends it out of true. This causes severe rubbing on the caliper and the disc has to be bent/trued back on the trail - which is difficult. Lately, I have switched to using Magura rim brakes, which I now prefer. Seeing that the support for rims brakes is dwindling fast though, I decided I would try to solve the issue of bent discs with a bash guard. So far (2 weeks) this setup has solved my issue - I have taken several falls where the bash guard prevented my disc from bending. There are several disc systems available for unis - KH External disc, Mountainuni external disc, Nimbus Internal Disc. Each system has different options for bash guards. The mountainuni disc system uses standard bike cranks, but mounts a disc in place of chainring. This system made it easy to buy a bash guard (or chainring) - I just needed to buy something that has 5 bolt holes and uses a 110mm bolt circle diameter (110bcd). This option uses the ISIS bolt and axle to mount a guard with a central hole. Thick aluminum bmx chainrings are a good guard because they use a central hole that fits the ISIS bolt. On KH cranks , the chainring bashgurad needs to be cut to make room for the crankarm. 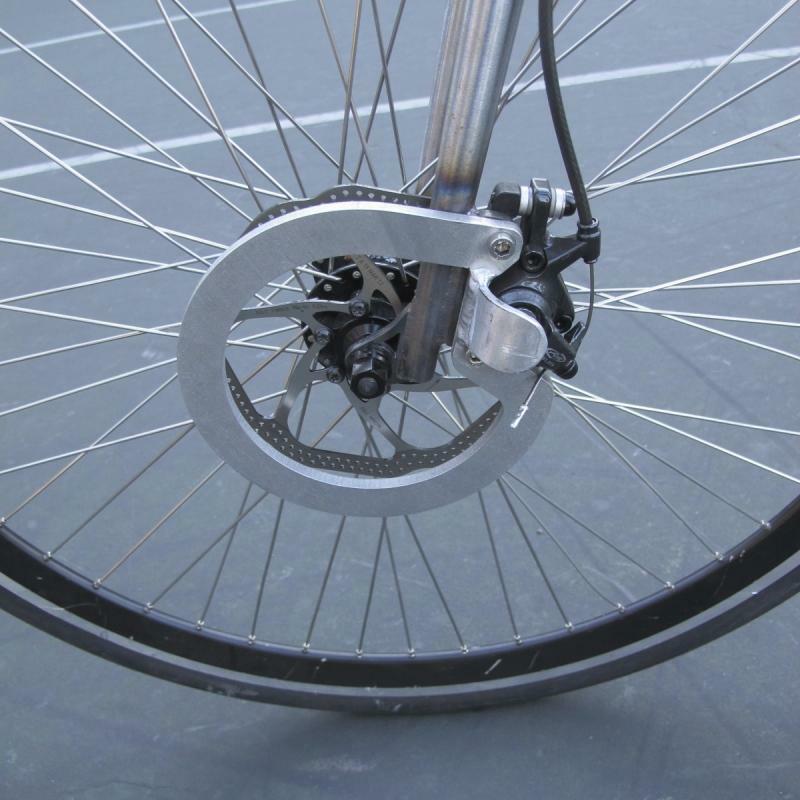 When mounting the bash guard, it is most effective to mount it in the space opposite of the crank arm where the disc is unprotected. Leaving some gaps between the bash guard and the crank arm seems to be OK.
-Chainring Spacers - I had to get enough of these to space the bash guard out from the disc so it cleared the caliper. I needed about 10mm worth of spacers per bolt for my caliper. It helps to get some that can fit around the outside of the chainring nut as well. -Measure the distance from the where one of the disc mounting bolts meets the crank, to the outside of the caliper and 5mm or so for clearance. It is likely this will be at least 10mm. 2. Get a bash guard and chainring bolts / spacers (see Materials section above) so that it can be mounted with enough clearance per 1. - The bash guard can be cut using a Dremel or similar tool, or drilled to fit better or save weight. When using a chainring as a bash guard, I removed a portion of it because it interfered with the crank arm (see pics). - Remove the existing chainring bolts from the crank arm disc mounting holes where the bash guard will be mounted. - Insert the longer nut into the 1st disc mounting hole on the crank arm ( make sure any disc spacers are also in place that were there previously). - repeat for all of the holes used for the bash guard. - NOTE: mounting the bash guard and the spacers was akward. It took patience. It was easiest to do with the wheel off of the uni frame, but I needed to mount at least the first nut/spacers/bolt with the wheel on the frame to check for clearance with the disc caliper. - Bash guard must be about the diameter of the disc and have a central hole large enough to fit the ISIS bolt (bmx chainrings work well - see Materials section above). - The bash guard must fit flush against the crank where the ISIS bolt goes through the hole. Any crank (KH, Sun) where the crank arm protrudes out from the axle will require the bash guard be cut so it can mount flush. For an aluminum BMX chainring, it is easy to cut these to the correct shape with a Dremel or similar tool. - (optional) grind teeth off (if using chainring), drill extra holes to save weight. - Mount bash guard and ISIS bolt. Tighten long ISIS bolt down slowly, being careful to keep the bash guard center over the hole and aligned so it is rotated correctly on the crank (so it protects the disc opposite the crank). - NOTE: Make sure the long ISIS bolt has a good number of threads engaged in the axle so the crank stays on and the threads hold if the bash guard takes a hit. Personal judgement is required to determine if the crank is secure and the bolt is threaded to the axle sufficiently. I also put thread locker on the end of the ISIS bolt. - The pictures for Option 2 show the process and results of using a BMX chainring bash guard installed on a KH Spirit disc crank with a Shimano BR-M446 Caliper using a 203mm disc (the 180mm disc fits fine too and is covered even more by the bash guard). Both of these bash guard methods have solved my problem of bending discs. I have only tested them for a few rides, and will post follow-ups for long term durability etc. I have not had any issues with the bash guards hitting my feet or ankles yet. I also haven't had the long ISIS bolt come loose (option 2). - Prevents Bending of discs when the uni crashes. This article was posted so I could share a shade-tree DIY solution that has worked for me so far, but will probably end in complete disaster for you or anyone else. I make no guarantees of its effectiveness or safety. If you damage your cranks or braking system with this it will likely void any warranty you have on those parts, so there! Pictures for Option 2 in above post. NOTE - Disc shown loose on top of bash guard is a 180mm disc, but the disc mounted on the uni is a 203mm disc. This improves protection of the disk. The teeth on the sprockets may or may not be problematic as decreases clearance between crank and pedal. A good start though. you don't wan't to get caught by that chain ring with your calfs. This could end the same way as it ends with the old chainsaw discs from Qu-AX. I would chose a non rotating bah guard, a static housing of the discm attached to the bearing cap or even clamped between bearing cap and frame. Last edited by Eric aus Chemnitz; 2018-03-17 at 10:18 AM. Yes - the chainring teeth are a bit risky looking. So far they have not sawed off my ankle, or even touched it, but I see your point. I was planning to grind them off of the bash guards eventually for aesthetics and safety. Of course, on the other hand, bicycles place multiple chainrings at the same location and there are a lot of people riding those with no issues. I think that for muni though, there are many more UPDs than for a bike on any given ride. That would make the chances of getting sliced by teeth higher. I like the idea of a frame mounted bash guard for internal disc setups. A simple version that mounts to the end caps and disc caliper mounting points would be pretty easy to make with simple tools. I am concerned though that it could put extra stress on the frame, especially if an impact caused a lot of torque in the wrong place. Thanks for the inspiring pictures! Are all of those bash guards custom made or do you have links where they can be bought? 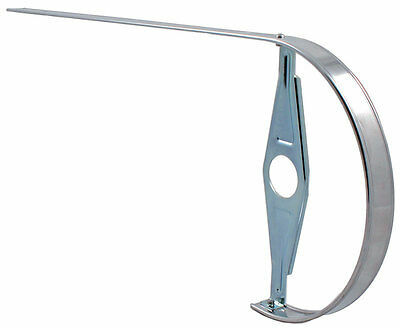 I just did a picture search for "disc brake guard". Such guards can be bought, afaik. But some of the pics look custom made. Not more than regular. As the bash guard does not need to be thicker than the caliper. I think I definitely prefer the one from Eric's pictures that are attached using the caliper posts, at least then they're not spinning! If you've got your heart set on a spinning bash guard of doom, is there any reason you couldn't just attach one to the KH Spirit cranks (where the disc normally goes) but use an internal, hub-mounted disc brake, rather than having both attached to the crank? So get an Oracle or QX disc uni, but put KH cranks on, and use that crank to attach your bash guard. Last edited by Piece Maker; 2018-03-26 at 12:28 AM. That would work, except that the inboard brakes mount to the left hand side of the hub and the KH mount is on the right. So flip the hub upside down? Is it handed in any way aside from the disc mount? And where do you mount the caliper then? To the front? Nono. Inside is always left, outside is always right. 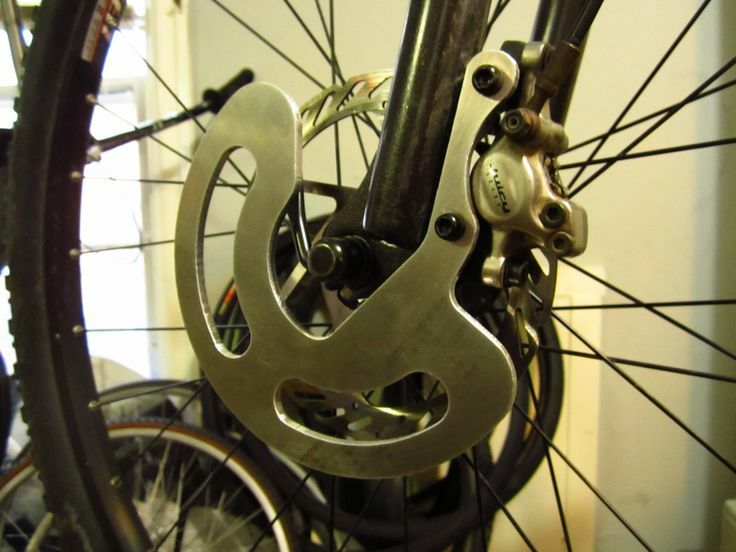 If you take a Nimbus hub, and flip it over so the disc mount is on the 'wrong' side, are you not still able to mount the caliper right where it normally goes (Either on the KH frame's caliper mounts, or using a Nimbus d'brake, mounted to the wrong fork)? How would this result in the caliper being on the front? Then your KH crank will be on its 'correct' side, and you can screw a bash guard into it.